Guayaquil, officially Santiago de Guayaquil, is the largest city and the second most populated canton of the Republic of Ecuador; also known as the "economic capital of Ecuador", with a population in its metropolitan area close to three million inhabitants. The metropolitan area of ​​Guayaquil, also known as Gran Guayaquil, is ranked among the largest cities in America. It is also an important trade center with regional, financial, political, cultural and entertainment influence. The city is the cantonal head of the homonymous canton and the capital of the province of Guayas. Located on the coast of the Pacific Ocean in the coastal region of Ecuador, the east of the city is on the banks of the Guayas River, about 20 kilometers from its mouth in the Pacific Ocean, while it is surrounded by the Estero Salado in its southwestern part and the beginning of the Chongón Colonche mountain range, a chain of mountains of average altitude, in the northwest. The Gulf of Guayaquil is the largest water inlet of the Pacific Ocean in South America. Its extreme outcrops are set at Cape Blanco, in Peru, and the province of Santa Elena, in Ecuador, covering a distance of 230 km. Located on the coast of the Pacific Ocean in the coastal region of Ecuador, the east of the city is on the banks of the Guayas River, about 20 kilometers from its mouth in the Pacific Ocean, while it is surrounded by the Estero Salado in its southwestern part and the beginning of the Chongón Colonche mountain range, a chain of mountains of average altitude, in the northwest. The Gulf of Guayaquil is the largest water inlet of the Pacific Ocean in South America. Its extreme outcrops are set at Cape Blanco, in Peru, and the province of Santa Elena, in Ecuador, covering a distance of 230 km. The region where Guayaquil is located has very fertile soils that allow abundant and varied agricultural and livestock production. Cotton, oilseeds, sugar cane, rice, bananas, cocoa and coffee are grown and tropical fruits such as mango, passion fruit (world's leading exporters), papaya, melons and many more. Tropical flowers and plants of the Guayas River are also exported, as well as the tropical dry forest of Cerro Blanco, the Chongón Dam with its large artificial lake and Puerto Hondo with the navigable mangroves and sea arms. Also, it has different species of woods such as guasango, palo santo, muyuyo, pegapega, chipra, mosquero and cardo; able to withstand long droughts. In the same way there are many poultry farms and cattle and pig farms. In the gulf area there are deposits of natural gas of great potential, for this reason its entire continental shelf is considered as an oil prospecting. Cajas National Park, two hours from the city of Guayaquil on the road to the city of Cuenca. Machalilla National Park, in the south of the province of Manabí, approximately three hours from the city. Manglares Churute Ecological Reserve, one hour by road to Naranjal. Mangrove Wildlife Production Reserve El Salado. El Morro Mangroves Wildlife Refuge, one hour away in the Playas canton. Protected Forest Cerro Blanco, within the urban perimeter of the city, at kilometer 16 of the Guayaquil - Salinas highway. Coastal Marine Fauna Production Reserve Puntilla Santa Elena, approximately an hour and a half. Parque Lago National Recreation Area is located at Km. 26 of the Guayaquil - Salinas highway. Santay Island National Recreation Area, located in front of the city. Samanes National Recreation Area, located within the urban perimeter of the city. Protected Forest Cerro Colorado with the Botanical Garden of Guayaquil, located within the urban perimeter of the city. Cerro Paraíso Protective Forest, located within the urban perimeter of the city. Bosque Protector Prosperina, located within the urban perimeter of the city. Palo Santo Trail Protector Forest, located within the urban perimeter of the city. Throughout the years it has continued with its commercial tradition, and currently in a fundamentally economic process, it is committed to tourism, reflected in the changes in the ornate of the city, with an improvement in the self-esteem of the citizens, it has been a process that It has taken years, since the last two municipal administrations. Guayaquil has thus developed into a national and international tourist destination, hosting fairs and international events. The downtown area of ​​Guayaquil is one of the most important places for national and foreign tourism, since it is the oldest and most colonial. The Malecón 2000 area is of great tourist interest and is close to the center. The Point, located in the area of ​​Puerto Santa Ana, is the largest building in Guayaquil and the country. The "Las Peñas" neighborhood is another place of interest, with approximately 444 steps and ends with a viewpoint where you can appreciate the view of the city. One of the most significant places for tourists is the Malecón 2000, named after the name of the Foundation that executed the work. The original name is Malecón Simón Bolívar. This work is a project of urban regeneration of the old pier. With 2.5 km of extension it offers its visitors, in addition to security, great monuments of the history of the city, museums, gardens, fountains, viewpoints, shopping centers, restaurants, bars, food courts, the first IMAX cinema in Ecuador , docks, from where you can board boats for day and night trips on the Guayas River. 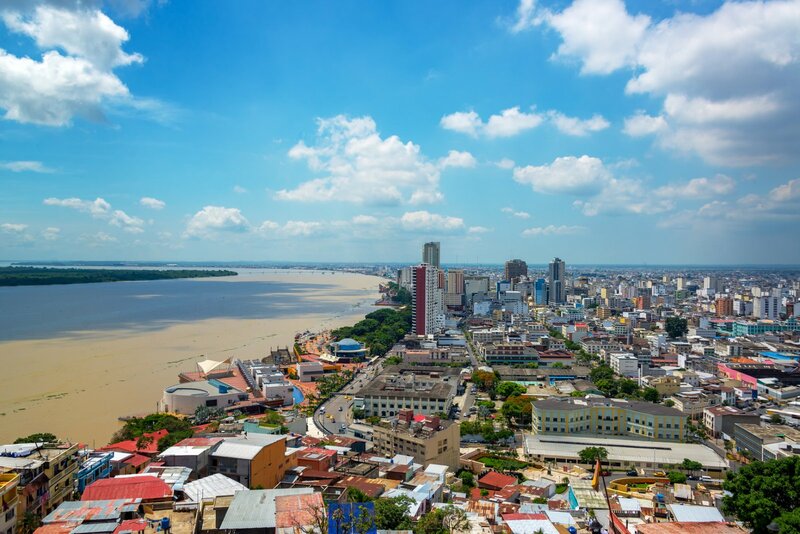 According to studies carried out by the Municipal Public Company of Tourism, Civic Promotion and International Relations, 54% of tourists arriving in Guayaquil are foreigners and 98% of tourists recommend the city as a tourist destination. In the Malecón del Salado: you can enjoy family walks in the estuary in small boats and admire the flora and fauna of the estuary; There are also discos, restaurants, and bars. Las Peñas: is the oldest neighborhood in Guayaquil. In recent years it has been transformed to become one of the main attractions of the city. Puerto Santa Ana: is an architectural megaproject similar to the Coconut Walk of Miami or the Puerto Madero of Argentina, it is a residential, commercial and potentially tourist place that has several buildings of contemporary construction and luxurious apartments. Its first stage was inaugurated in 2007. Puerto Hondo: tourist site to enjoy the flora and fauna (mangrove reserve) and practice water sports such as swimming, rowing boat, kayak, etc. It has a beach and traditional and typical food service. Cerro Blanco: km 16, road to the coast. You can admire flora and fauna of dry forest, you can enjoy adventure tourism in an ecological reserve with the possibility of camping from one day to another. Cerro Santa Ana: is located northeast of the city, next to Las Peñas neighborhood and a few meters from the Malecón. It is the place where Guayaquil originated. It is colorful and visiting it is pleasant, since you have to climb 456 steps, until you reach its peak, where you can see the north of Guayaquil. El Cerro is full of cafes, bars, craft shops. Etc. Seminar Park: it is located in the Rocafuerte sector in the center of the city. In this park you can see a monument to Simón Bolívar, as well as a great variety of green iguanas. Seminario park is bordered on the north by Clemente Ballén y Millán street, on the south by Tenth August street, on the east by Chile street and on the west by Chimborazo street, which was regenerated for the specific use of pedestrians since it connects the park with the Cathedral of Guayaquil. Samanes Park: It is located north of the city, precisely in the sector of the Samanes. It is the third largest park in Latin America, since it extends from the Guayas River to the Via a Daule with approximately 851 hectares. It is a recreational park that has a large number of soccer, tennis, basketball and handball courts; It also has an area of ​​lagoons and a concert area with a capacity of 10,000 people. In this park a stadium was built that was named in honor of the late football player Christian Benítez Betancourt, with a capacity of 8,000 people. In this stadium the Guayaquil City Soccer Club of the Seria A of Ecuadorian soccer plays of local. Extreme sports: Near Guayaquil there are small towns surrounded by a lot of nature ideal for practicing extreme sports and outdoor activities. Canyoning or canyoning that consists of descending by canyons or waterfalls is one of the most practiced by tourists who come to Guayaquil and who are looking for some adventure nearby, also rafting and tubing that consists of navigating fast-flowing rivers is another sport Outdoor adventure very practiced. The typical food Guayas is known for the excellent quality of its fish and seafood, for the great variety of vegetables and vegetables, and for its delicious fruits. The great variety of native and unique dishes are highlighted in the 25 cantons that Guayas has; these delicious dishes are the result of the fusion of traditional ingredients and the culinary secrets that have been passed down from generation to generation, and in this way they have built a gastronomic identity for the province of Guayas and a plate of food has the special flavors that they have maintained and belong to the folcklore of Guyanese families .. Among the main inputs or ingredients we have: Peanuts, green and ripe bananas, seafood, rice, poultry; all of these very easy to obtain. This way gastronomic dishes are elaborated such as: rice with stew and meat, dried (chicken, chicken, duck, etc. ), the fritada, the fish bun, bolones, cebiches, chicha slide, guatita, among others. In the province of Guayas, especially in its capital Guayaquil, there are numerous food and beverage establishments that sell international dishes. In Guayas there is a great diversity in restaurants, its gastronomic offer is very rich and it has great accessibility to restaurants of international and Creole food. There are well defined areas among its 25 cantons; This gastronomic diversity is the result of its great natural resources, the environment and cultural influence. In this way we can establish areas where certain typical dishes predominate.